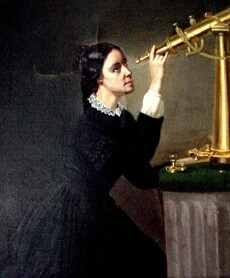 Maria Mitchell, an amazing woman astronomer who was always very smart and of course successful. She knew what she wanted to do at a very young age, Astronomy. Maria Mitchell’s early life, contribution to science, and accomplishments are some incredible things she did. And her legacy carried on even after her tragic death. Maria Mitchell was born in 1818 in Nantucket, Massachusetts. Where she grew up learning how to chart the placement of the sun, moon, and stars as a child. Under those circumstances Mitchell charted her first eclipse at 12 years old. Again at 17 years old she accurately surveyed the island of Nantucket with her father and impressed everyone who knew. Maria Mitchell loved astronomy and started learning it at a very early age which helped her greatly in building her success later in life. What Maria Mitchell did for science and astronomy is incredible. By taking daily photographs of the sun, she made many discoveries about the nature of sunspots. She was working as a librarian and studying the night skies, in due time she discovered a comet at age 29, not far from Polaris. The comet she discovered became known as the Mitchell’s Comet. Which brings us to our next subject. Maria Mitchell had many accomplishments, including that she earned a gold medal from the King of Denmark due to her discovery of the comet. The following year she became the first women member of the American Academy of Arts and sciences. After that, she became the nation's first professional woman astronomer and became professor of astronomy at Vassar college and taught several well-known women astronomers. After her death in 1889 her students continued to visit her birthplace in Nantucket. Her birthplace has been preserved as the Mitchell’s house. In 1994 she was elected to the National women’s hall of fame. Maria Mitchell’s early life, contribution to science, and accomplishments are some incredible things she did. Maria Mitchell was well liked by her students, after her death they visited her home and many others as well. Maria Mitchell was a great women who greatly contributed to her passion. Astronomy.